The skateboard vs scooter faceoff has been going on for ages and rages on as the popularity of scooters grows among kids – and even grow-ups. Pro scooters, aka kick, stunt, trick, or street scooters, are one type of scooters – other types include large commute scooters, 3 or 4 wheel scooters, electric scooters etc. In this post, I want to compare apples to apples, i.e. skateboards vs pro scooters. Both are kick-powered (foot-propelled) devices that can be used to do cool tricks in the streets and at the skatepark. Just looking at the above list, you can tell the score between skateboard and pro scooter is about tied! Which one is a better choice for you depends on how much value you place on each of the above criteria. First, let’s look at some key differences between the two. In case you’re new to all this, kick scooters have (most frequently) two aligned wheels, and a handlebar you use for steering. Skateboards have four wheels and no handlebar, you steer with your feet and weight shifting on top of the trucks. Skateboard and scooter both have a deck you stand on. 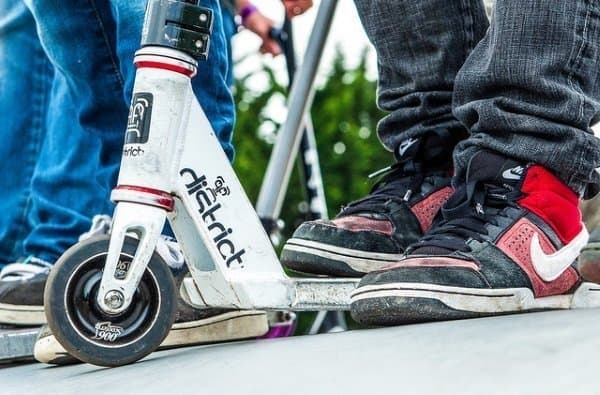 On a scooter your feet always sit between the wheels, whereas on a skateboard they may sit between (drop-throug, drop-deck) or on top (topmount) of the wheels. Let’s look at the main moves you perform when riding on a skateboard or a scooter and compare the difficulty between the two. Kicking for gaining speed is easier on a scooter than on a skateboard because you hold on to the handlebar. On a skateboard, you have nothing to hang on to so need to balance on a single leg while you push with the other. Turning is easier on a scooter than on a skateboard because all is needed is to turn the handlebar slightly to steer. Turning on a skateboard requires pressing into the rail with your toes or heel and leaning forward or backward without losing your balance. Merely riding while rolling is easier on a scooter because it’s quite stable and you hold on to the handlebar. 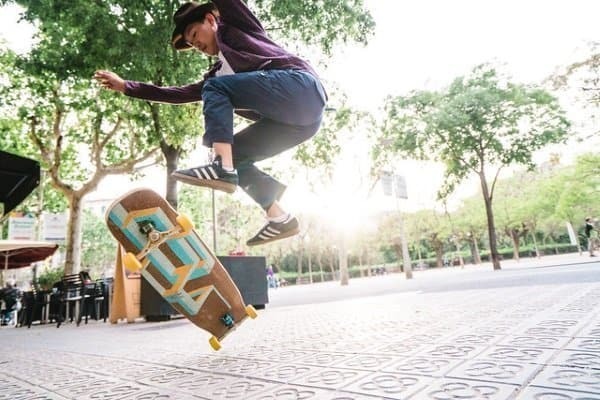 On a skateboard, a newer rider can easily lose balance and have the board shoot from under them due to a bump in the ground, falling sideways. This is more unlikely to happen on a scooter. Maneuvering on a scooter is easier than on a skateboard because you can due very tight turning in very little space due to the single front wheel and the fork, sort of like on a tiny bike. Tight turning on a skateboard without losing your balance (e.g. doing a kick turn) requires more skills due to the four wheel design. Stopping is typically easier on a scooter as most come with a foot brake – a fender-like component you can push on with your back foot to rub against the back wheel. Other kick scooters have bmx-like hand brakes. Even on a scooter without a brake, stopping is easier than on a skateboard because you use the handle to hold your balance while you put your foot down for braking. Foot braking on a skateboard, on the other hand, is challenging and requires good technique. Sliding is another advanced way of stopping on a skateboard. Ease of riding: scooter wins! If you or your kid will be using the scooter or skateboard for commuting to school or other short distance tranportation, a skateboard may be more convenient than a scooter as a skateboard can easily be carried around inside a building or a store. A pro scooter is typically lightweight and some are foldable, but it’s generally not as portable as a skateboard. You take your skateboard with you everywhere and you store it under a desk, while for a scooter it may not always be practical. Most riders agree that it’s easier to learn the basics of scootering than skateboarding. It’s quite straightforward for a newbie to hop on a scooter, grab the handlebar, and push around. It doesn’t take long to learn simple tricks like the bunnyhop. In contrast, initially learning to balance on a skateboard, kick push, and foot brake requires a lot more practice. Scooters don’t require as much balancing skills as skateboards. As I mentioned above, learning to turn on a skateboard is also more challenging than on a scooter as you need to shift your balance. Riding over small obstacles is also harder since you need to learn ollie – whereas a bunnyhop on a kick scooter comes naturally after a short while. Ease of learning: scooter wins! Skateboard vs scooter: which is harder to master? Beyond the basics, however, it can be just as challenging to learn advanced tricks on a pro scooter than on a skateboard. It may take 6-8 hours for a newbie to learn how to do a good ollie or kickflip on a skateboard. Likewise, mastering a tailwhip or a 360º on a scooter takes a lot of practice. Although some tricks may be easier to master on a scooter than on a skateboard, scooter riders tend to perform harder tricks, making up for the difference. So a 360 on a scooter may be equivalent in difficulty to a 180 on a skateboard, and a double whip may be comparable to a kickflip. A kickflip (skateboard) may be harder than a tailwhip (scooter), but a backflip 4 whip is definitely harder to learn than a kickflip. Nosemanuals and 50’s are much harder to pull on a scooter than on a skateboard. So while scootering is easier to pick up, it’s equally hard – or perhaps harder as skateboard to truly master and progress past a certain level. Mastery: skateboard & scooter equal! Skateboard vs scooter: which is cooler? The primary target market for kick scooters – and the image most people have – is younger kids aged say 7-13. Skateboarding is generally associated with older teens (including the “rogue”, rebellious types) but also adults who commute or cruise on skateboards or longboards. Comparing the image of scooters vs skateboards often revolves around skatepark and stret riding. Skateboarding is typically considered cool since the skills required for riding on a vert or grinding on a rail are quite high. As mentioned, advanced scooter tricks also involve significant skills but the predominant image of scooter riders is one of young kids hanging out at the park and getting in skaters way. The image of scooters is evolving, however, as more and more “grown-ups” are commuting on them on a daily basis. Kick scooters are practical, they can fold up for carrying on buses and trains. This all adds to the positive image. Skateboard vs scooter: which is safer? Skateboards have a higher center of gravity than scooters – which ride very low to the ground. Skateboards decks need to be relatively high off the ground to provide enough wheel clearance and avoid wheelbite. On a skateboard, you have nothing to hold on to for support, so the risk of losing balance and falling is higher. On the other hand, it’s easier to hurt yourself with a scooter’s handlebar when doing stunts at the skatepark. When rolling faster, e.g. downhill, a skateboard often gets speed wobbles (shaking), which can lead to a crash! Scooters are more stable at speed and never get wobbles due to their two-wheel design and tighter axles. Skateboard vs scooter: which provides the best exercise? Both skateboards and scooters give you a great workout since you constantly need to kick to keep moving. You can alternate feet when pushing to spread the effort across both sides of your body, though that’s easier to do on a scooter than on a skateboard. One may argue that a skateboard gives you a more complete workout because of the more intense balance training you get (no handlebar). As a result, your core ab muscles are engaged more intensely. Commuting on a skateboard typically requires more effort than commuting on a scooter. So in the end, which of skateboard vs scooter is better for you? If you (or your kid) have strong balance skills and/or are a patient learner, skateboarding will provide a nice challenge though at the cost of higher risk of falling. A kick scooter, on the other hand, is a lot of fun and can be a nice and safe means of transportation. It can also be an opportunity to build up your skills if you choose to learn advanced street and park tricks on it.